Post 1 of 2 – Work Night Out! Hello everyone! Sorry for the lack of activity. I’ve been a very busy girl what with work, shopping, wrapping presents etc, and yesterday was no exception! 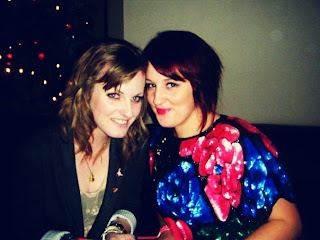 It was the work’s Christmas do last night which meant it was time to dress up and have some lovely (FREE) drinks! 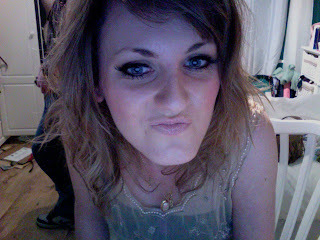 Here’s a picture of me before I went out, sorry I was in a bit of a posey mood ha, and my room was a TIP! I wore a black bandeau dress, leggings and platform mesh heels, with a GORGEOUS vintage chiffon cropped top in cream that was covered in beading, courtesy of Kavita at iheartvintage from the giveaway I won! It had another top underneath that acted as a lining, but I took that out so that I was just left with the chiffon part. I love it! I accessorised with a vintage cameo necklace, piles of bangles, and an oversized teal mock croc clutch that I found in Primark for £6! As you can see, I went all out and used false lashes. I think they are going to become my new best friend from now on! I’ve got quite few photos, but didn’t really want to put them up without people knowing, so I’ll just show you this one, stolen from the lovely Hannah at Patterned Tights. ( I went a little crazy on Photoshop with this picture, purely because I’m so pale and looked a little ghostly.) I’m very jealous of Hannah’s gorgeous vintage dress. It was beautiful! Lets just say the night wasn’t very atmospheric but we had a good laugh and the taxi ride home with five other girls in the snow was the most entertaining part. It was nice to see everyone out of their all black uniforms for once! As you can see I’m wearing my fringe back to the side now as I was getting a bit fed up of having the same boring straight style every day. Time to grow it out I think! I heart this picture…Im stealing it back – just with pre-done photoshopping!